These rare and exceptional Victorian solid silver grape shears were made by Edward Hutton of William Hutton & Sons. 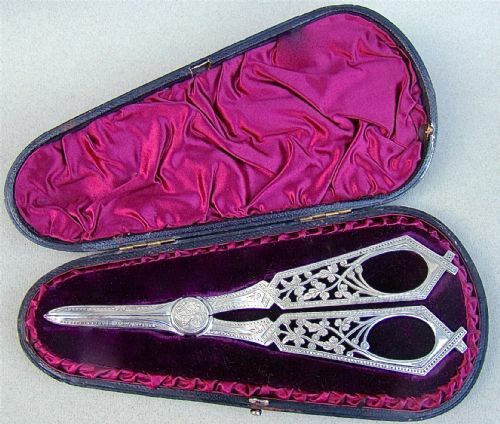 They are dated London 1887 and are very much in the Victorian Gothic revival style with their architectural angular outline and elaborate pierced decorations. The geometric flat handles pierced with trailing ivy, the rounded blades hallmarked on both sides and engraved with prick-dot decorations. The central medallion engraved with foliate decorations. Presented in the original Moroccan maroon leather case lined with velvet and satin. Date letter "S" for 1887. Length: 17cm / 7 inches. They are in excellent condition and working order. 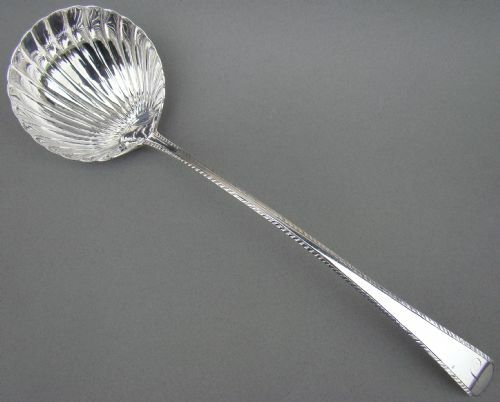 This elegant Old English pattern George III silver serving spoon or basting spoon was made by Edward Lees. It is hallmarked for London 1803. It has a very good gauge of silver and is in excellent condition. A superb spoon. Date letter "H" for 1803. Length: 30.5 cm / 12 inches. Weight: 78 g / 2.7 oz. Excellent. No dings, no dents, no engravings. This is a very decorative pair of silver plated fruit servers made by the prolific Barker Brothers and darting circa 1890. The shell shaped bowl with gilt interior and matching shell pattern handle. Presented in the original leather, velvet and satin case. BB over B inside a trefoil for The Barker Brothers Silversmiths Limited. Length: 20cm / 6 inches. Postage UK: £5 Recorded First class. Postage overseas: £8 Standard parcel. 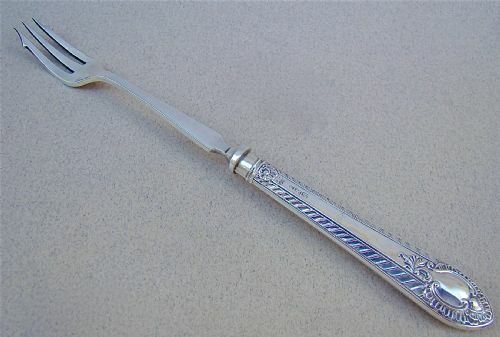 This is a useful and elegant silver plated pickle fork with silver handle. The silver plated stem marked EPNS . The silver handle with gadroon borders and shell and scroll decorations. JD over WD for James Deakin & Sons. Date letter "m " for 1904. Length: 17cm / 6.4 inches. 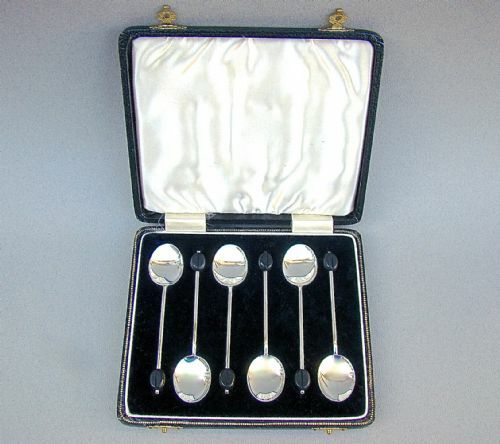 This distinctive set of six coffee spoons was made in Birmingham 1933. 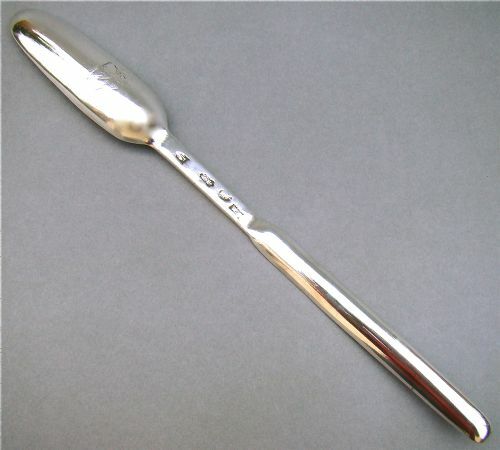 Coffee knop spoons were very popular in the thirties and this is a lovely example in excellent original condition. They are fitted in their original Morroco black leather case, the interior lined with cream satin and black velvet. S Ld for William Suckling Ltd. Date letter "J" for 19303. No dings. No dents. No repairs. 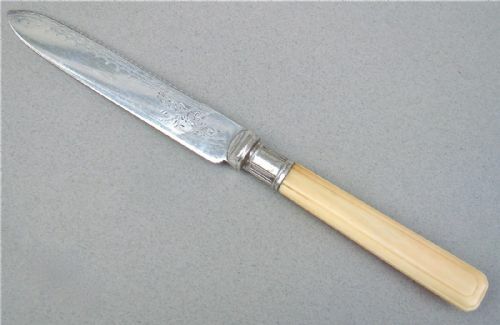 This elegant cake knife was made circa 1890. 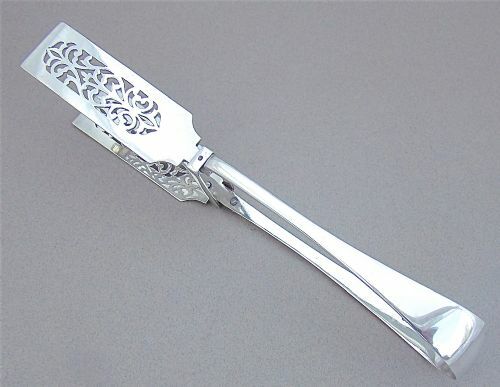 It has a delightful engraved silver plated blade and a carved ivory handle. The serrated blade delicately engraved and bearing electroplated marks. Length: 25cm / 9 inches. Both handle and blade in very good condition. Postage UK: £5.00 Recorded delivery. Postage overseas: £7 standard parcel. 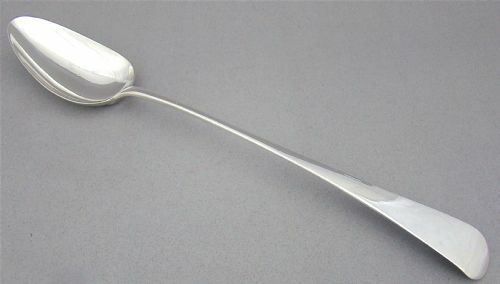 This early George III silver soup ladle was made in 1773 by John Lampfert, specialist spoon maker, who is renowned to produce very fine pieces. The feather edge stem terminating in a shell bowl. Very good silver gauge, as can be seen by looking at the thickness of the handle. Engraved Monogram "S" to front of stem. Date letter "s" for 1773. Length: 33 cm / 13 inches. Bowl diameter: 9cm / 3.4 inches. No dings, no dents, no repairs. 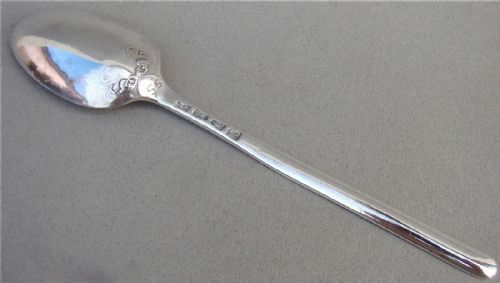 This is an exquisite and rather scarce George II silver marrow spoon hallmarked for London 1756 and bearing the marks of Roger Hare. The larger bowl with shell back and engraved initials underneath. It has a remarkably clear set of hallmarks. R H for Roegr Hare. Date letter "A" for 1765. Length: 22cm / 9 inches. These desirable solid silver asparagus tongs are dated London 1864 and bear the marks of Chawner & Co, the most important mid 19th Century flatware makers. The blades are pierced with scroll patterns within a classical reeded border. The flexion of the blades is restrained by a plain hallmarked rectangular bracket. The Old English handles are free from initials. They have a good gauge of silver, a testimony of their quality. Date letter "i" for 1864. Width of blades: 3cm / 1.2 inches. This is a very elegant set of six sterling silver lobster picks dated Sheffield 1901 and bearing the hallmarks of the Atkin Brothers. 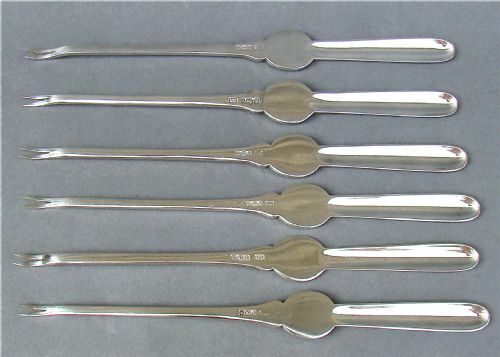 Each with a plain rounded scoop to one end and a two pronged pick at the other. HA for the Atkins Brothers. Date letter "i" for 1901. Length: 19cm / 7.3 inches. Combined weigh: 182g / 7.7 oz. 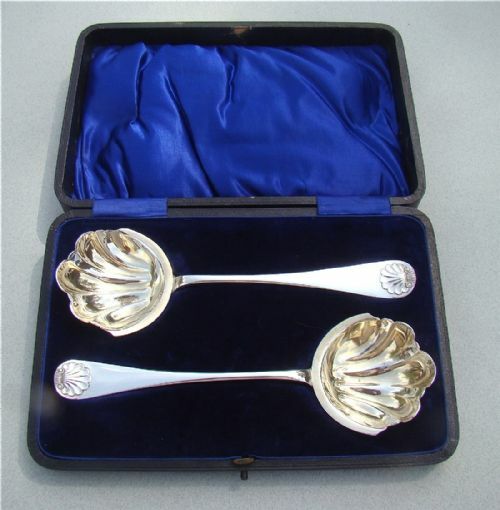 This is an exquisite mid Victorian silver cased serving set in pristine condition. The handles, beautifully applied with intertwined convolvulus leaves and berries, indicate these were probably used for fruitS such as melons or for desserts. 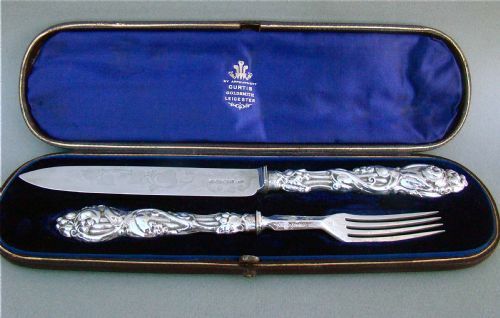 The blade and tines finely engraved with conforming decorations. Fitted in the original Morocco leather presentation case lined with satin and velvet. Gothic date letter "F" for 1861. Postage overseas: from £15 International Signed For. This is an exquisite George III silver double ended marrow scoop hallmarked for Dublin 1783 and bearing the marks of William Ward. Conventional double ended form. The larger bowl engraved with the crest of an eagle. Length: 23cm / 9 inches.